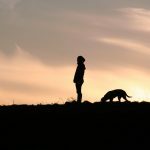 Home » For Pet Lovers » Do You Know This Simple Technique to Battle Compassion Fatigue? When I recommend meditation, mindfulness, deep breathing and exercise in my compassion fatigue seminars and workshops, it’s because it has had a profound affect on me and my mental state. I’ve battled more than one addiction in my life and have come to realize how universal these simple, yet powerful practices can be when we incorporate them into our daily life. Speaking of addictions, they are simply coping mechanisms that almost work. The object of our addiction (food, drugs, alcohol, technology, etc) almost soothes the dissonance we feel and the emotions we are trying to avoid. Almost. How do we stop torturing ourselves with our own intense emotions and critical thoughts? Allow the feeling to permeate you, I can tell you it won’t let up until you actually feel it so why not just do it now? It won’t overtake you. You can handle it. Breathe and accept it as a friend. Feelings aren’t our enemy and yet we treat them as such. We do all kinds of things (see above) to avoid them only to find out they are never as intense as we imagined. This doesn’t mean we like the feelings but we are acknowledging that they are there rather than continuing to try to push them down, away and distract ourselves from them. Be curious about where in your body you are feeling the feeling or what you are believing about yourself. A favorite question to myself is “What am I making this mean?”. When we can be curious without judging we often can see that our thinking is often misconstrued. We might also find that certain feelings are directly linked to our old tapes that are playing in the background, usually a version of I’m not good enough. This is the most freeing part of the technique, to realize the thoughts and feelings are not YOU. You can literally step back and watch them from afar, not attaching, linking up with or identifying with them. It’s not that we are ignoring them (at all!) but we realize that we are not our thoughts. As the popular bumper sticker says Don’t believe everything you think. That’s life-changing advice right there! Julie Squires is a Certified Compassion Fatigue Specialist & Educator who brings a unique perspective and approach to support the sustained energy and passion of animal workers. Her company, Rekindle LLC, offers on-site compassion fatigue seminars and workshops to veterinary hospitals, animal shelters and other animal organizations.